Snow Leopard OS X out 28 Aug? Apple looks like it is readying itself for a 28 August release date for its Snow Leopard operating system, much to the delight of Mac owners worldwide. An extended Bank Holiday weekend is the perfect opportunity to settle down with Apple's latest operating system, to familiarise yourself with its latest updates and features (although your better half might not be entirely happy with you dedicating some 'me time' to your Mac instead of her/him). Apple is also planning a music-related press event on 7 September, so expect to see more discounting of Apple iPod and Mac hardware later next month. Snow Leopard was originally announced at Apple's Worldwide Developers Conference (WWDC) has been available to pre-order on Amazon for a few weeks already. Amazon and Apple are now running 28 August as the release date for Snow Leopard, so you may want to pop down to your local Apple Store next week, or just order it online (if you can put up with waiting a day or two longer). 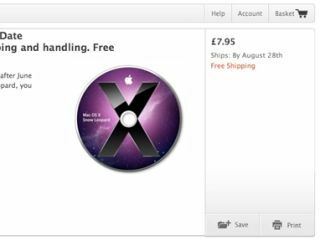 Macenstein has also published Apple training documents based around the Snow Leopard launch, also dating 28 August as the release date. Apple promises faster boot-up times and increased stability with its latest version of OS X, alongside 64-bit support, application support for multicore processors and a smaller footprint, meaning you get a smidgeon of extra space on your hard drive, with up to 6GB saved. US prices for Snow Leopard are confirmed to be $29 for the upgrade and $129 for the full package. UK pricing is still to be confirmed. And for more on Snow Leopard check out some of TechRadar's recent OS X coverage.